One Pittsburgh School Dials Up a 3D-Printed Delivery! Of course, you know that all you have to do is dial up your favorite pizza place in order to have hot, tasty pizza delivered to your doorstep. So, if it’s innovation that’s whetting your appetite these days, you may be glad to know that our Inventionland Institute team now is able to deliver that to you, too. Later that same day, Field received a message from a long-time contact at the Christ the Divine Teacher Catholic Academy in Pittsburgh, Pennsylvania. “She said school board members were interested in buying a 3D printer and she wanted to know if we had any recommendations,” said Field. Of course, Field had a very recent recommendation that came with on-site delivery and training. Within a month’s time, the order for two 3D printers was approved and on its way. Just last week, a few of our designers delivered the two custom 3D printers to Christ the Divine Teacher Catholic Academy and it didn’t take long for the instructors there to begin discovering all of the possibilities their new technology could create. 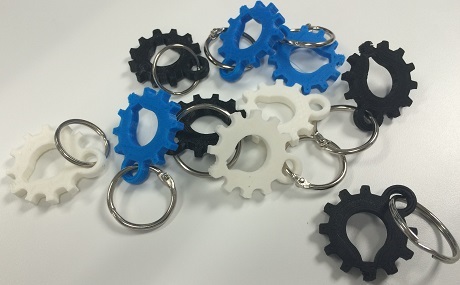 To further showcase the capabilities and allow both the instructors and students to give their new equipment a customized first print, Field and our team arranged for the printers to create Inventionland keychains. Now, it’s up to the Christ the Divine Teacher Catholic Academy teachers and students to let their appetite for creativity lead them to their next print!